With Renegade fast approaching (less than 3 weeks to go now!) I've been looking for inspiration for my stall set up and fun display ideas. 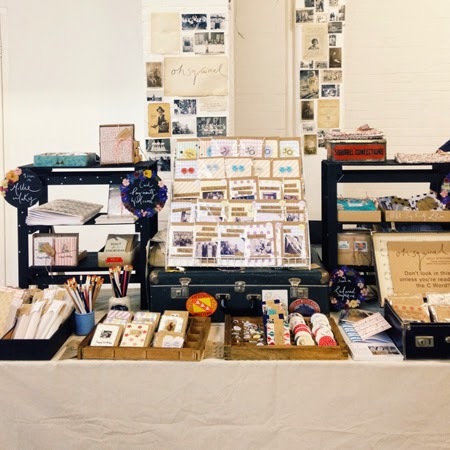 I've spent lots of time (when I should be working on new products) looking through Renegade's photos of past fairs on Pinterest and Flickr, as well as various blog posts about 2013 and 2014's London fairs, and getting lots of inspiration. 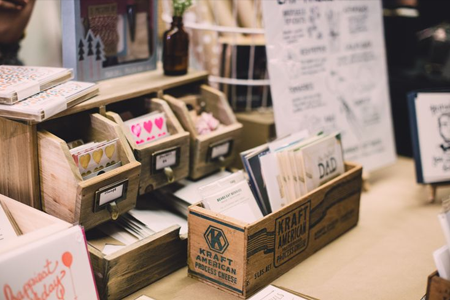 So I thought I'd share some of my favourites here, and it'll also give you a taste of the standard of sellers you can expect to see if you visit the fair this year! This one is from Renegade's "Exceptional Booth Set-ups" board on Pinterest (I'm not sure what fair its from). 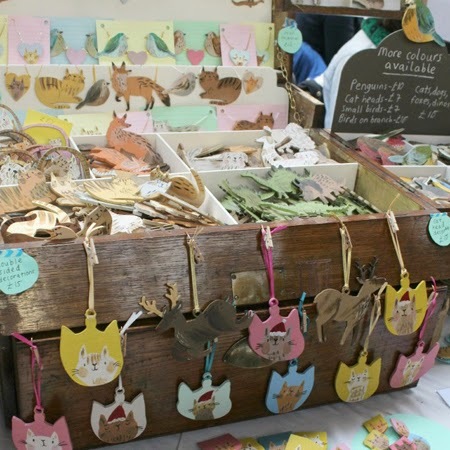 Here Paper Generation have used various old boxes and chests to display their paper goods. I've followed the work of Katie from Oh Squirrel for quite a while now and always love every picture she posts on her Instagram. 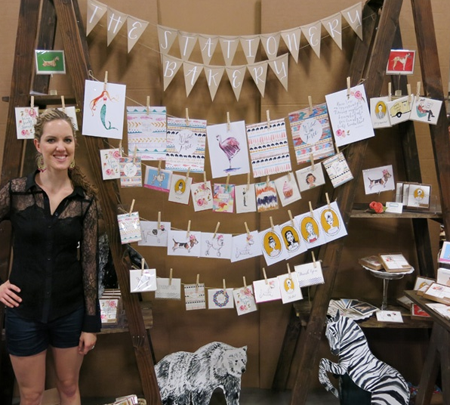 I particularly love her display from last year, she's used so many clever ways of displaying her beautiful products, and I'd definitely be stopping for a look if I walked past this stall! For the 2013 fair she made lots of her own displays which all looked great. I especially liked the "Tattoo Parlour" she made for her temporary tattoos! 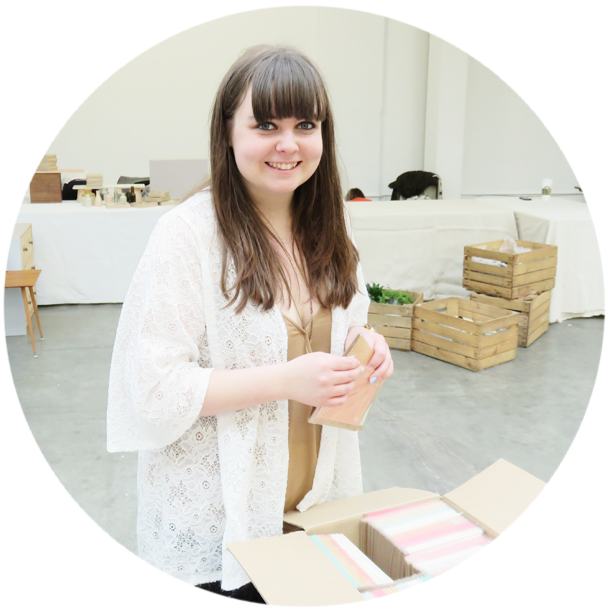 Hand-making displays is a great idea if (like me) you've already spent quite a lot on stock and want to save a bit of money, plus you can make it to the exact sizes you want to suit your products! 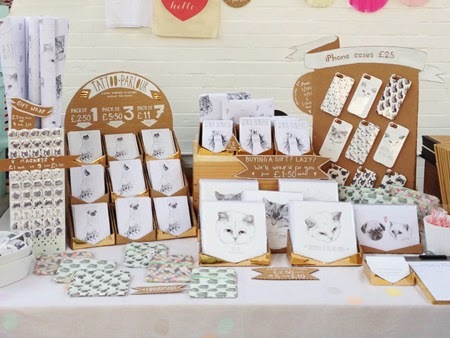 Another one from Renegade's "Exceptional Booth Set-ups" Pinterest board (again not sure what fair its from) of a fantastic display by Stationery Bakery. I love everything about this display: The bunting, the ladders as shelves, the animals and the cards pegged up onto string! This is a great alternative display to just using a table. I love the style of this display by Emma Carlisle, the big chest full of products reminds me of a pick'n'mix or something in a toy shop, this would definitely stand out and make me stop and look! 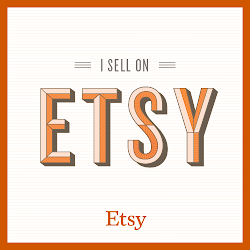 There's plenty more Craft Fair inspiration over on my Pinterest board! I definitely need to get working to come up with an interesting set-up! I have quite a lot of new products to display so I need plenty of ideas for adding space an height to my booth.